Wall to wall media coverage, a book and a Panini sticker album – what more do you want from a World Cup? As part of Women’s Sport Week (#WSW2015), Women’s Views on News will be profiling some of the great events to come throughout the summer, beginning with the Women’s World Cup in Canada. Three things I thought I would never see in relation to a Women’s World Cup; every game on the BBC, an accompanying book and a Panini sticker album. And yet, here they all are for Canada 2015. The tournament kicks off this week and so far there has been an amazing amount of interest from both supporters and media in England and around the world. For the first time there will be 24 teams, as there are in the men’s tournament, and a record number of eight making their World Cup debuts. There is even a “group of death”, group D, which comprises USA, Nigeria, Australia and Sweden. England’s first, and by far their hardest, group game is against France, on 9 June at 6pm. This will be followed by Mexico on 13 June at 9pm and Colombia on 17 June at 9pm (all times BST). England certainly have something to prove after their disappointing exit at the group stage of the Euros in 2013, which signalled the end of Hope Powell’s reign as manager. Her replacement, Mark Sampson, has undoubtedly made changes for the better, but realistically England’s Lionesses are probably looking at reaching the quarter finals at best. As to who is going to win it, I can’t look beyond Germany, pushed by USA and Brazil. You can’t count out the holders, Japan, after their stunning achievement of 2011. Many people’s dark horse is France, and I wouldn’t rule them out either. And at the risk of sounding hideously trite, hopefully in the end women’s football will be the winner, with the “bounce” meaning increases in participation, attendances at matches and further media coverage. But the biggest thrill for me? The Panini sticker album, of course. As a child I religiously bought, collected and swapped stickers with my schoolmates for each World Cup and even domestic seasons. The first one I remember – and still have, somewhere – is for the 1982 World Cup in Spain. 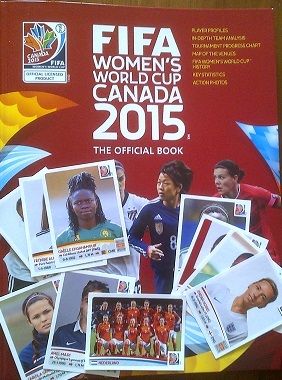 To see a Women’s World Cup album is absolutely incredible. And in these days of social media, swapping is so much easier! Tune in and back England’s #Lionesses. Or Canada, or Germany. Or anyone. Just watch it and be inspired!